But I don't really trust it. Honestly, I don't care at all about my collection's value (although I guess if it were worth $100k I probably would care a lot more!). To me, a lot of my collection is worth almost nothing because it's easily replaced in the event of a catastrophic loss; while a significant fraction of my collection is priceless to me, because it would be impossible or nearly impossible to replace if I lost it. It's not trust, it's math. It's average sales over a definite time period. It's a statistic. To clarify, I meant that I don't trust that as true market value. I realize how they arrive at those numbers, but those are just sales figures based on Discogs results and don't take other important variables (other markets, location, condition, going rate, etc.) into account. Chriss Ons and phish like this. I have a self selected value for my vinyl with my insurance company end of story. How would it work for you with such enormous fluctuations? I know which end the insurer would use. If the person has replacement cost insurance, it covers the cost to replace the collection, record by record. You would most likely receive a depreciated amount up front and be reimbursed the difference for everything you replaced once you hit the dollar amount you were originally paid. But would they replace the AP/MOFI pressings with the first available pressing found on amazon ? My stuff is irreplaceable and they accept my value and the premium is in line with what i insure for. 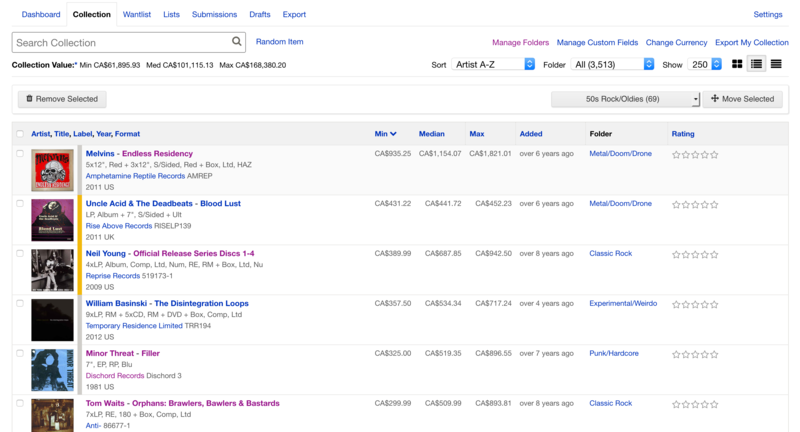 Discogs is hit and miss on many fronts. Not if you have "Replacement Cost" insurance. I could go into details, but it's pretty boring, so I won't. 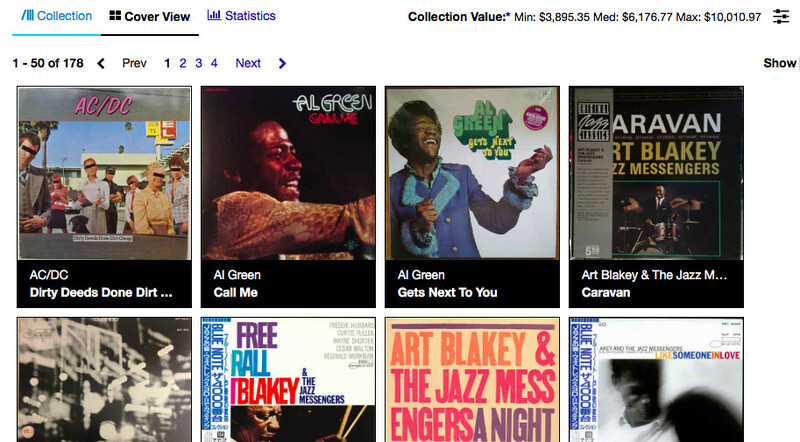 My best advice is document, document, document, and discogs is a pretty easy way to do that. It doesn't have your pressing, you can add it. It's free. Pretty hard to beat for documenting a vinyl collection. black sheriff, PhantomStranger, Harvey Rickenbacker and 1 other person like this. I don't know how insurance is regulated in Australia. I agree with what some of you guys have said about these stats...not necessarily accurate, etc. For me, it just helps give me a general idea of what my collection is worth, and I realize that just because Discogs rates it at a certain amount, it in no way means its actual value is determined strictly by Discogs. There are so many unseen factors that can make it much more valuable, or much less. Autographed copies, miscategorized items that are actually more valuable pressings (or less), incorrectly rated conditions, etc. Not to mention, all those items in my collection that don't currently show any sales history; therefore, no value at all. I have lots of those. Something I'm curious about, though, is whether or not the Discogs value ratings update in real time in relation to other sales of albums in said collection. I haven't paid attention to that, but I would think it is, and doesn't just stay at the value it was when it was added to my collection, or based on what I paid for it at the time, etc. Sometime in the future, I would like to have my collection authentically appraised by someone/a company who knows what they're doing and dealing with, and realizes the intricate details of a record/music collection and the things that determine its true value. To have someone come in who would just base its worth on what current repressings/reissues would cost, without regard to specific details of pressing, autographs, condition, etc. is tantamount to complete foolishness. It does update in real time. The value of my collection usually changes slightly once or twice a day or so. I don't fancy entering stuff they don't have be it LP or 7" as for me it is not time well spent and my insurance is sorted. Adjustable construct of human social agreement. I my add new purchases to my "collection" whenever they arrive in the post. Memory ain't what it used to be, and it helps me not buy stuff I've already got. If they impress after a few test plays I then remove them from my "Wantlist". PhantomStranger and uzn007 like this. I just hit 300 CDs in my collection which is a minuscule amount compared to pretty every collection on here but given 2 and a half years ago I probably didn't have 50 CDs I think its a decent effort. Also not looking for anything rare or obscure nor do I collect vinyl. I just get the CDs I want from the bands/artists I want to own on physical media. Man, I thought I was bad, but some of you folks have some serious collections!